Welcome to the Write Right podcast. Today, we’ll talk about special cases in subject-verb agreement. Correct subject-verb agreement in writing helps readers better understand your ideas. Verbs must match subjects in tense, but also in number. If your subject is singular, your verb must also be singular. If your subject is plural, your verb must also be plural. Most subject-verb agreement rules come naturally to us, but there are a few special cases that are important to remember. The first special case is two subjects joined by either/or and neither/nor. When a sentence contains these phrases, the verb matches the subject closest to it. For example: “Neither my shoes nor my shirt has buttons.” Since the noun closest to the verb is singular, shirt, the correct verb is also singular—has. If we were to reverse the order of the nouns in this sentence, it would read, “Neither my shirt nor my shoes have buttons.” The plural verb have is correct in this case because the closest noun, shoes, is plural. 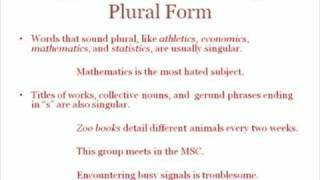 Our third special case is nouns of misleading plural form. Some nouns sound plural because they end in s, but they actually refer to singular objects or ideas. Words like athletics, economics, mathematics, and statistics are usually singular. In a sentence, you should say, “Mathematics is the most hated subject,” and not “Mathematics are the most hated subject.” Other nouns that may sound misleading are titles of works, collective nouns, and gerund phrases that end in s. Treat all of these nouns as singular subjects in sentences, and use singular verbs with them. In our example sentences, “Zoo books details,” “group meets,” and “encountering busy signals is” are all singular subjects paired with singular verbs. The last special case in subject-verb agreement is subjects connected by the words both…and. The rule for this case is simple: always use a plural verb. We have two examples. “Both the CEO and his advisors agree on the issue.” “Both she and her sister must pay for the damage.” As you can see, regardless of whether the subjects are singular or plural, a plural verb is used in each sentence. Thanks for listening to Special Cases in Subject Verb Agreement.